No less than President Rodrigo Duterte himself requested the employers of Overseas Filipino Worker (OFWs) in Hong Kong to allow their workers to attend the protest rally against him. This is according to former senator and Foreign Affairs Secretary Alan Peter Cayetano, who accompanied the president in his Hong Kong visit. “Yes, the president instructed me to write a request letter addressed to all the employers to our OFWs in Hong Kong so they will allow their workers to join the protest rally if they want to. This is to show that Filipinos abroad also have the right to express their sentiments.” Sec. Cayetano told Filipino reporters in Hong Kong on Thursday, April 12. 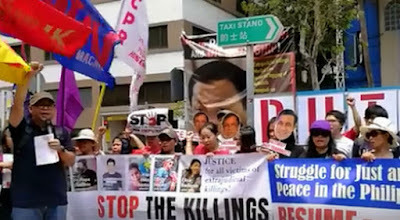 According to reports, some 50 OFWs joined the Hong Kong Campaign for the Advancement of Human Rights and Peace in the Philippines (HKCAHRPP) and militant group Bayan in Hong Kong in the anti-Duterte rally, to protest the so-called extrajudicial killings (EJKs) in the Philippines, related to the government’s intensified war on drugs. In an interview, Bayan Hong Kong President Eman Villanueva said they will also urge President Duterte to reconsider the removal of Jalilo Dela Torre, the Philippines’ former labor attaché to Hong Kong. Last March 23, Dela Torre received a memo, ordering him to report back to his head office in Manila, and that the recall shall take effect immediately. President Duterte arrived in Hong Kong on Tuesday, and is expected to meet with some 2,000 members of the Filipino community on Thursday evening. Earlier, he had a bilateral meeting with Chinese President Xi, and thanked China for their assistance during the Marawi siege. The meeting took place before the Boao Forum for Asia.